Taking the trip in Way Back machine here. In October 2007, I decided to take a trip to Coronado Island in San Diego. I had a free hotel room, courtesy of the wife, and great friends in the area so it was a no-brainer. On this trip I decided to try as many local brews as possible. My gracious co-hosts Erin and Ryan took me to a wonderful bar called the Yard House. 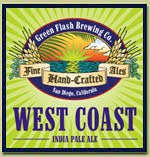 So many beers on tap, and one of them was the West Coast IPA from Green Flash Brewing Co. Why do you care about this? Well for one, my wife, Erin, Ryan, and the Yard House are all awesome. And two, this trip started the Beer Crusade. After getting back I emailed reviews of all the brews I tried and people convinced me I should start the blog, the rest they say is history. Of course, I procrastinated several months after the visit, let;s just say I needed months of convincing to start this thing. The West Coast IPA uses several hops which combine to make a bitter, yet well balanced entry into the land of IPAs. Despite the confluence of hops, the beer does not come off as too hoppy, much in the same way it's 7% ABV is not too alcoholly in taste. The beer is caramel in coloring and pours with generous head. If you like your IPAs on the bitter side, but not too bitter, the West Coast IPA is for you. One final note on the Green Flash Brewery, on their employment page they suggest that they always can use some help on bottling days, for some reason this always made me think I could start my own brewery. The West Coast IPA gets a 3.5.